The Petty Cash Register helps you track your petty cash traffic. The Invoice and Service Invoice help you track and bill for your services and products. Track and manage all of your receivables with the Invoice Log. The Purchase Order template helps you keep track of your purchases. Keep a handle on all of your supply chain purchases with the Purchase Order Log. Track your inventory flows with the Inventory Log. Make your fax interaction with you customers and clients clean and consistent with our professionally designed Fax Transmission Sheet. The Shipping Order and Bill of Lading help you track all your shipments, whether they're computer programs or steel desks. The Cash Receipt helps you track all of your cash receipts. The Useful Office Forms for Excel also contains two easy-to-use worksheets for planning your business finances. The G & A Expense Budget helps you take into account general and administrative costs. Furthermore, the Expense Budget helps you plan for all your expenses. 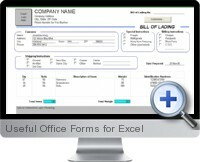 Designed for users who want just the forms to get them started, the Useful Office Forms for Excel is an ideal solution.